Andrew Belkus Again Shows His Prowess in Golf! 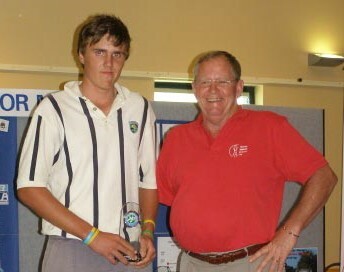 14 year old Australian Lithuanian Andrew Belkus again showed his golfing prowess by winning South West Rocks Junior Classic (5-6 May 2007). This competition on the New South Wales North Coast is an important competition for juniors. Andrew won with scores of 77 and 73 (par 72). In the photo we see Andrew with the famous Australian golfer Jack Newton during the presentation of the winner’s cup.